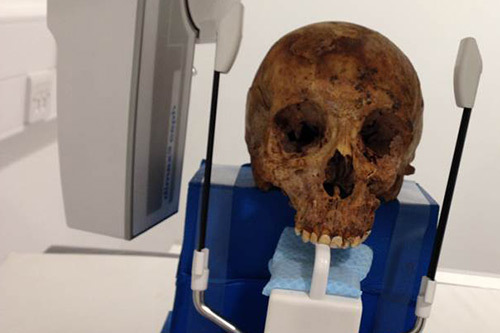 A new book from the Museum of London detailing burial grounds found during Crossrail excavations features contributions from radiography researchers at City University London. Containing x-ray images of bones found during the work on the Crossrail tunnel around St. Marylebone’s Paddington Street, the material was brought back to City where it was radiographically imaged by Paul Bland and Sophie Willis in the School of Health Science’s cutting-edge radiography facilities. Archaeological aging of individuals at time of death is largely undertaken via macroscopic visual methods, but teeth and certain bones can benefit from additional analysis with radiographic imaging. The relationship between the Museum of London and the School of Health Sciences at City University London started in 2005 with a collaboration between the Saad Centre for Radiography and the Museum’s archaeology department. In the intervening years, researchers from City have fostered a close relationship with colleagues in the Museum, with imaging of artefacts taking place in the Tait building. During the 18th Century the expansion of the wealthy London parish of St Marylebone led to the development of two additional graveyards to relieve pressure on the church and churchyard on Marylebone High Street. The latest of these, on the north side of Paddington Street, was in use between 1772 and 1853. As part of the excavations which took place between 2012 and 2013 on the same site, archaeologists recorded 386 burials from 124 single, stacked and brick-lined graves at the western edge of this ground. As part of the most recent project, the City team took radiographs of bones from some of these skeletons. These archaeological findings - and detailed analysis of individuals’ bones provided by Paul Bland and Sophie Willis - were combined with documentary research to provide an account of a burial ground in the new publication, “St Marylebone’s Paddington Street north burial ground: excavations at Paddington Street, London W1, 2012–13”. You can find out more about the Museum of London Archaeology book here.